Another PDP governor had condemned the election. The Governor of Gombe State, Hassan Dankwambo, has congratulated the candidate of the All Progressives Congress (APC), Kayode Fayemi, for his victory in the Ekiti governorship election. 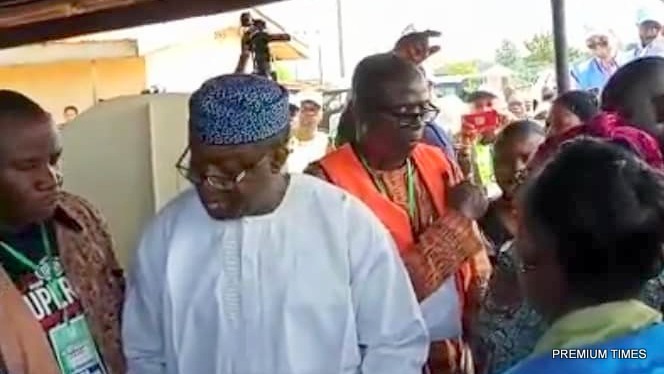 Mr Fayemi, a former minister of solid minerals, defeated the Peoples Democratic Party (PDP) candidate, Olusola Eleka, who is the deputy governor of Ekiti. Governor Dankwambo is of the opposition PDP. “We gave all the necessary support to our party and the candidate, Professor Kolapo Olusola Eleka to win the #EkitiDecides2018, but sad we lost. In life, you win some and lose some. “Congratulations to the winner, Dr. John Kayode Fayemi,” Mr Dankwambo tweeted on Sunday using his personal Twitter account @HEDankwambo. “I call on our supporters to be steadfast. We must not lose hope and be discouraged. The task ahead is too great for us to dwell on the current setback. This defeat should further strengthen our resolve to give Nigerians, a credible alternative in 2019,” the governor said on the social media site. The governor’s spokesperson, Junaidu Usman, confirmed to PREMIUM TIMES that the handle belongs to his principal. Meanwhile, other PDP leaders have said the Ekiti election wasn’t free and fair. “I have never experienced that kind of robbery in politics,” said Governor Nyesom Wike of Rivers State. Officially, the PDP says it is still reviewing the results and will make a categorical statement after the review.